Summer season is just around the corner and that is why every fashion clothing brand is going to present its new lawn dresses 2016 for young girls and ladies. Many of them have launched their collection and others are still displaying their collection of spring summer. 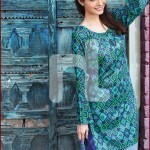 We have another great news for all fashion lovers who are waiting for summer collection of Nishat Linen. The wait is over now because on 12th of March Nishat Linen has launched its latest Summer Collection 2016 which comprises of funky prints and ethnic designs named as NISHA by Nishat Linen Summer Lawn Collection 2016 Volume 1 for women. This collection is made by using three stuff which are chiffon, crinkle and lawn which are all striking in prints as well as vivid in colors which is perfect for spring summer season. 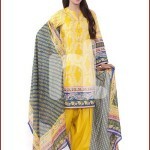 Both stitched and pret wear dresses are accessible in this collection and different suits have different prices. Prices of Nishat Linen summer collection 2016 volume.1 are very reasonable, these suits depend upon the quality of fabric like lawn, chiffon and crinkle. The three piece suits that comes along with embellished neckline or borderline are little expensive as compared to printed simple suits. Embroidery patches are also available with some of these dresses. Summer Collection 2016 by Nishat Linen consists of 3 pcs suits which are combined with chiffon printed dupattas on silk, bemberg, crinkle and charmeuse. All these suits bring vibe of the ultra feminine fluidity and silhouettes. Soft pastels, ornamental details and floral patterns are featured in this collection. 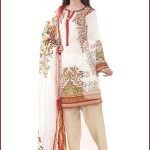 Graphic prints done on these dresses bring eye catching appearance towards these dresses. 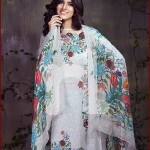 Price of Nishat Linen standard dress is PKR 3,315 and it comes along with 8.5 meter of printed lawn stuff. It is premium in quality. 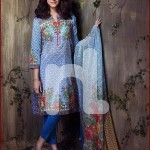 Most of the dresses which are unstitched on summer lawn range that costs PKR 5,000. Total 26 suits are adorned with different embroidery and printed work. Check below here legendary brand NISHA Fashion by Nishat Textiles summer lawn designs 2016 for girls with prices.